Happy New Years! I'm here today to add to the growing list of things everyone likes but I can't stand for reasons logical apparently only to me. Joining such popular items as red velvet cake, the color blue and most mainstream music I'm adding New Years resolutions to the list of things I hate. Don't get me wrong, I love goals. Those are great. I have plenty of those. I just don't like the idea of resolutions. I saw this awesome Mark Twain quote on Facebook yesterday and I couldn't agree more: "New Year's Day--Now is the accepted time to make your regular annual good resolutions. Next week you can begin paving hell with them as usual." My resolutions would be crap anyway. 1. Eat more candy. 2. Play more computer games. 3. Spend less time at work. 4. Paint more nails. 5. Continue not exercising because I have more interesting things to do with my spare time. Nailed it already! I figure I'm either going to do something or not do it. No sense wasting time resolving about it now only to be excited/disappointed with myself later. Maximum efficiency! And just think of all those moments of pleasant surprise when I actually do something right later this year. 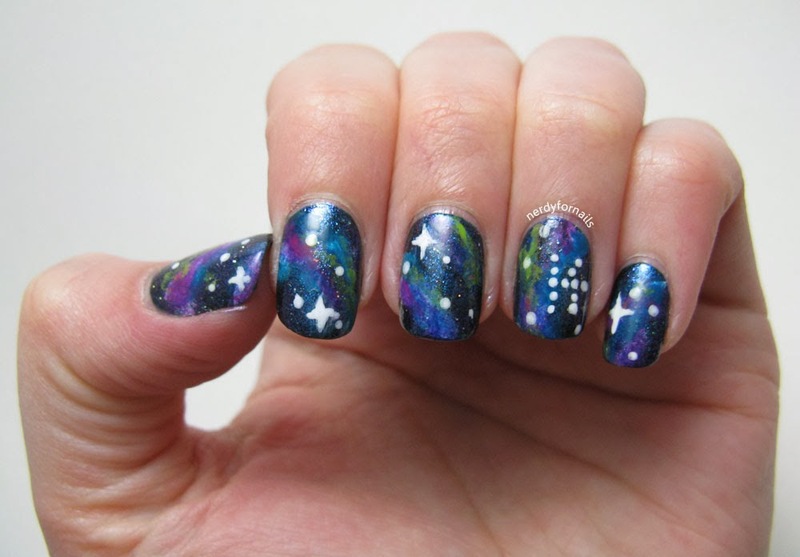 My mostly sarcastic dislike of resolutions won't stop me from painting some out of this world New Year's nails: galaxy nails with a little 14 written in the stars. 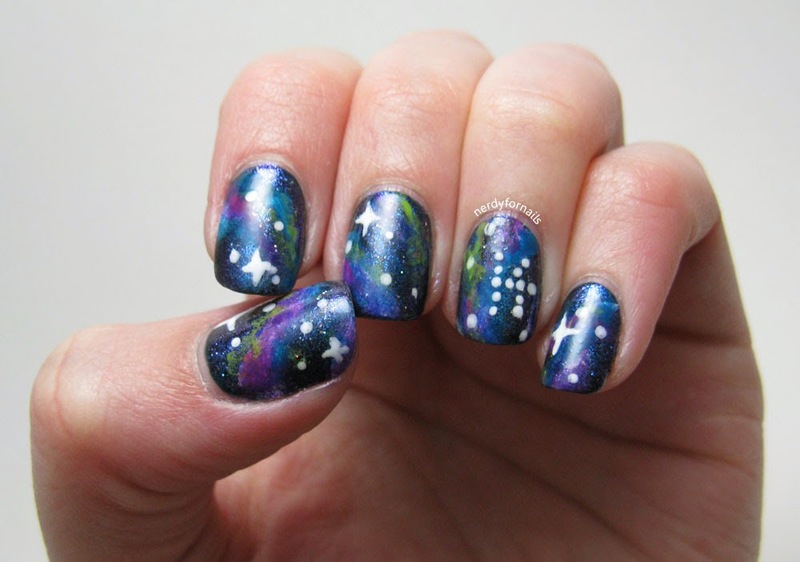 I used my franken creation Sparkleverse as the base for this galaxy manicure. I sponged on a few other colors for the galaxy swirls then used a dotting tool and small paint brush for the stars. 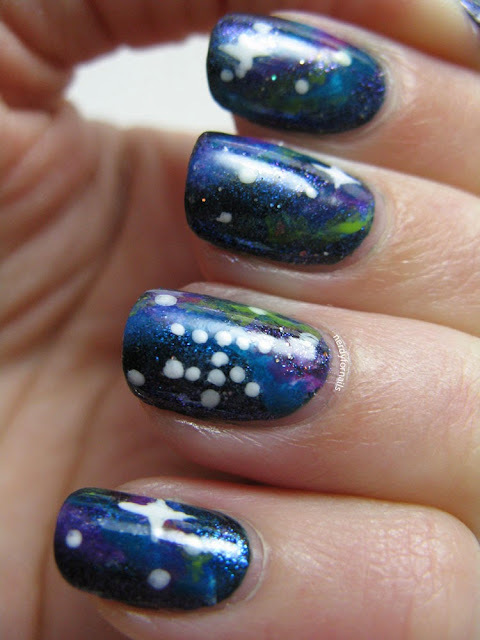 Colors used: LA Colors, white; Orly, Teal Unreal; Sally Hansen, Limestone; Kelly, unnamed purple foil. Do you make resolutions? If so what's your biggest one for this year? If not I'd love to hear why.